ePOS-Device is a technology for controlling POS peripherals and TM printers from Web applications and smart devices such as smart phone or tablet. ePOS-Device SDK has been migrated to Epson ePOS SDK. Epson products and functions released after the release of Epson ePOS SDK do not support ePOS-Device SDK. We recommend to migrate applications developed using ePOS-Device SDK to Epson ePOS SDK. For instructions on how to migrate, refer to "Epson ePOS SDK Migration Guide" that is included in the Epson ePOS SDK package. ePOS-Device SDK is a development tool package for the ePOS-Device. ePOS-Device SDK is made up of the following development tools. The applicable products for the ePOS-Device SDK are TM-Intelligent printers, TM-DT printer and TM-i printer (TM-i Firmware Ver.4.0 or later). (1)ePOS-Device SDK has an application interface (API). So the programmer doesn't need to understand ESC/POS commands to control TM printer, and the programming to print a receipt becomes very simple compared to an SDK without API. (2)ePOS-Device API command format and the function are almost similar between each ePOS-Device SDK. So the application programmer can control the TM printer(s) in the same way for the web application or native application development. These SDKs are the SDKs aimed at development engineers who are developing native applications based on each OS for printing on a TM-i printer using Wi-Fi and Ethernet interface. Also, by using these SDK, you can control the printer, TM printer connected to network, or peripherals such as a customer display or a barcode scanner connected to the printer, with simple code. -TM-T88V-i and TM-T70-i are supported from TM-i Firmware Ver.4.0 or later. -TM-DT series are supported form TM-DT software Ver.2.5 or later. The TM-DT series-specific features that are not provided for TM-i series cannot be used. API of ePOS-Device SDK has some restrictions. For details, refer to "README.en.txt" included in the ePOS-Device SDK package. ePOS-Device XML is a command system that defines the function to control various types of POS peripheral devices, including TM-Intelligent printer, TM mobile printer, and TM printer(s) which is connected to TM-Intelligent printer using XML. Application in devices such as PCs, tablet PCs or smart phones, creates a request message in XML format and send it to TM-Intelligent printer using socket communication. ePOS-Device Service installed in TM-Intelligent printer executes control over peripheral devices by interrupting a request message and returns a response. For more details, please refer to ePOS-Device XML Users manual, which can be downloaded at Download page. 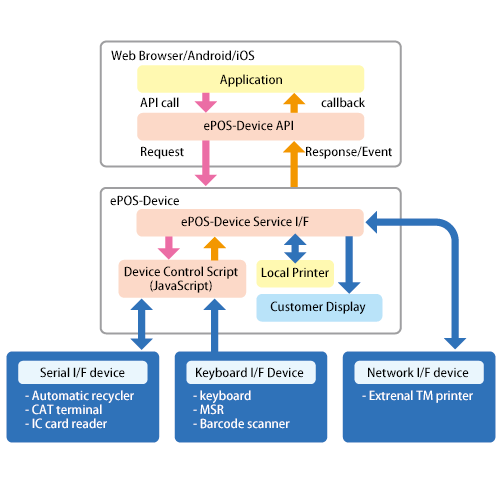 ePOS-Device SDK is the application interface (API) to control TM printer for an application using XML data. ePOS-Device has two layer structures. ePOS-Device Service I/F takes the interface with ePOS-Device API running at a Web browser. Then it controls the internal devices, built-in TM printer in the TM-Intelligent printer and optional customer display, or the external TM printer(s) which is connected through Ethernet or Wi-Fi network. For more details about ePOS-Device API, please refer to each ePOS-Device SDK User's manual, which can be downloaded at the Download page. The "Device control script " is to control Serial communication devices and/or Keyboard I/F devices. It is written in Java script. And by customizing the Device control script for certain POS peripheral devices, varieties of peripheral devices can be controlled by ePOS-Device. Epson periodically expands the supported peripheral devices that can be controlled by ePOS-Device. Please refer to the "ePOS device list " for information about the latest supported device list at ePOS-Device list page. [Note] Only TM-DT printer can be customized the "Device control script ", or can be developed a new one.